I want to thank everyone for pulling together to support our students and one another over the last two weeks. Through this difficult time, all of you stepped up and proved once again that the foundation of this campus is truly driven by the spirit of caring for one another. Now that we’ve made it through finals, we can look forward to tomorrow’s Commencement exercises to celebrate our graduates’ achievements. Again, mahalo for all that you do, and I wish everyone the best for a safe and restful summer. I look forward to seeing you in the fall. 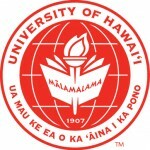 The University of Hawai‘i at Hilo announced today 13 students from public and private high schools in Hawai‘i will be the incoming cohort of Chancellor Scholars this fall. Michelle Biete, Leilehua High School. Rod Neil Burbano, Honoka‘a High School. Maria dePillis-Shintaku, Waiakea High School. Caleb Kow, Kealakehe High School. Amanda Kurano, University Laboratory School. Christian Lopez, Kapolei High School. Nevan Lowe, Waialua High School. Alyssa Mathews, Waiakea High School. Tara Marie Takafuji, Waiakea High School. Trayden Tamiya, Waiakea High School. Emily Travis, Mililani High School. Chloe Waters, Kamehameha Schools Hawai‘i Campus. Megan Woolsey, James Campbell High School. Each scholarship is valued in excess of $29,000 and covers four years tuition for students graduating from a Hawai‘i high school who have earned either a grade point average of at least 3.5, a combined 1800 SAT (reading, writing, math), or a composite score of 27 on the ACT, while demonstrating leadership and/or community service. All Chancellor Scholars are required to enroll as full-time students, and earn a minimum of 24 credits each academic year. Each scholar must also maintain a cumulative grade point average of 3.25 and participate in leadership activities and/or community service with other Chancellor Scholars. The University of Hawai‘i at Hilo and Hawai’i Community College are closely monitoring the ongoing Kilauea activity. 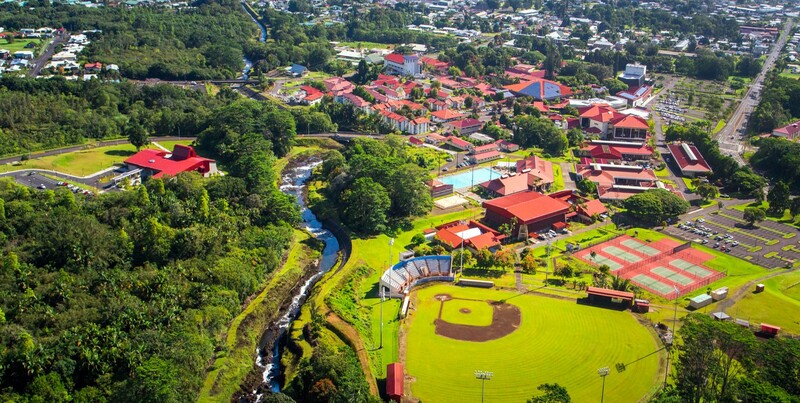 Here are a few of the exciting things happening at UH Hilo as we work together to provide positive learning experiences and support to prepare students to thrive, compete, innovate and lead. As UH Hilo heads toward the end of the spring 2018 semester and commencement, I’d like to share a few highlights with you. 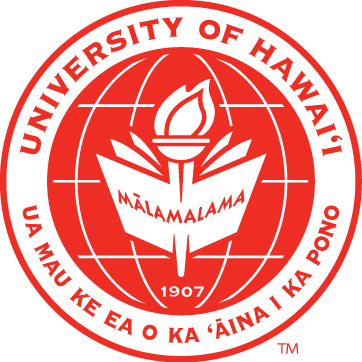 Earlier in the semester, three UH Hilo students each received a 2018 UH President’s Green Initiative Award recognizing their initiative, innovation, creativity and civic engagement in campus and community sustainability with cash prizes. Kasey Buchanan received the Johnson Controls Green Leader Award for a campus waste reduction project. Kara Spaulding received the HEI Charitable Foundation Green Leader Award for developing sustainability curriculum in the arts and perpetuating natural and cultural resources. Zoe Whitney received an honorable mention for producing a UH Hilo Carbon and Nitrogen Report Card. 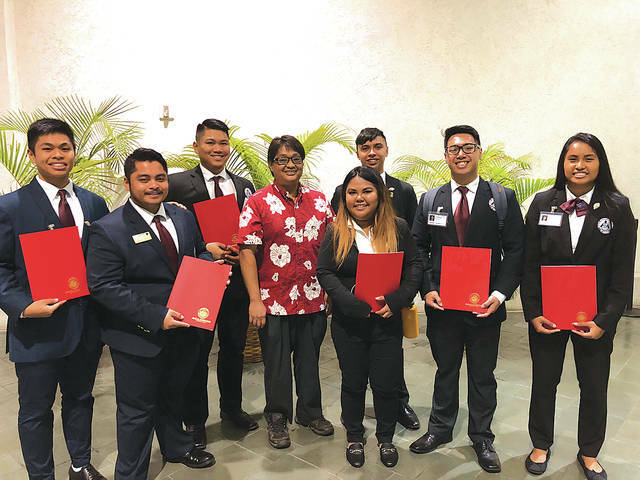 State Rep. Mark Nakashima (center) stands with UH Hilo HOSA delegates (l-r) Jeremy Villanueva, Lark Jason Canico, Kelly Gani, Leslie Arce, Travis Taylor, Sheldon Cabudol and Deserie Pagatpatan. Missing: Daniel Kimura, Kateleen Caye Bio and Kendrick Justin Dalmacio. Courtesy photo. UH Hilo students excelled at the 13th Annual Health Occupation Students of America–Future Health Professionals State Leadership Conference held on O‘ahu in February. All 10 UH Hilo delegates competing at the conference placed in their events, with one team taking first place in their category. In the process, students honed public speaking and interpersonal communication skills, gained knowledge, and networked. Three students from the Marine Options Program at UH Hilo came home in April with four awards from the statewide MOP Student Symposium held on O‘ahu. The annual event features oral and poster presentations by undergraduate students from around the state. This year’s UH Hilo winners: Wheatley Crawley for best poster presentation (conservation at Wai‘opae), Michelle Nason received the John P. Craven Child of the Sea award (project on a coral nursery), and Julia Stewart won best research project (coral research using bioinformatics) and the Ana Toy Ng MOP Memorial award (for contributions to MOP). These accomplished students—and many others too many to name here in this column—are already contributing in positive ways to local and global communities. Their research, leadership, sustainability, conservation and community-based projects are making an impact. I look forward to seeing more of their academic accomplishments and their work in the world after graduation. Group gathers at event celebrating Blue Zones Project Approved status. 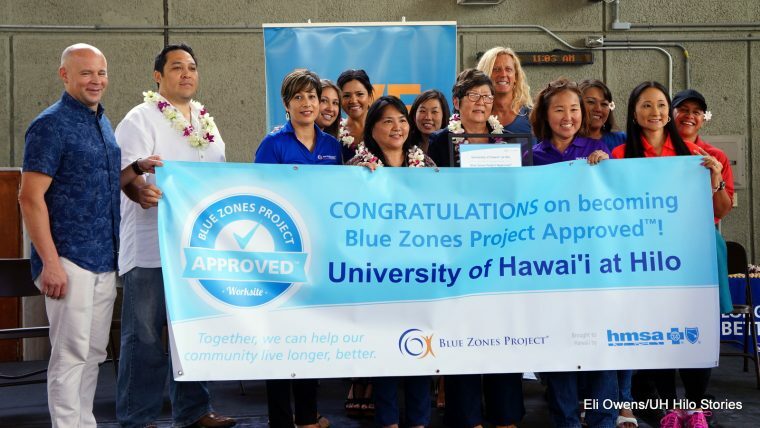 In April, UH Hilo received official designation as a Blue Zones approved workplace. The Blue Zones project is a worldwide initiative to promote healthy living and long lives. UH Hilo now joins a number of businesses and organizations working together to transform Hilo into a Blue Zones community by adopting healthy practices. As an institution of higher learning, we are already well-versed in developing healthy minds. We can now look forward to taking that next step to promoting overall physical well-being. Activities on campus include walking groups, healthy cooking demonstrations, and many other wellness pursuits. 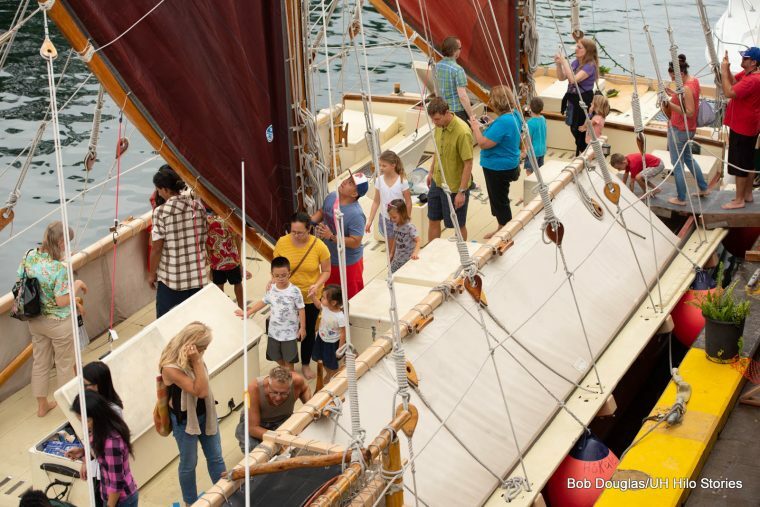 The iconic Hawaiian double-hulled sailing canoe, Hōkūle‘a, visited Hilo in April as part of its statewide “Mahalo Hawaiʻi Sail” as the crew expresses mahalo to numerous communities for their support of the three-year Mālama Honua Worldwide Voyage from 2014 to 2017. UH Hilo co-hosted an educational expo in April at Wailoa Pier where hundreds of schoolchildren and others from the East Hawai‘i community enjoyed tours of the Hōkūle‘a and hands-on educational activities to showcase ocean navigation’s connection to science, math, culture and conservation (photos). We’re proud of our very own Pwo Navigator and Captain Kālepa Baybayan and the many other people from the UH Hilo ‘ohana who participated in the worldwide voyage and the recent expo. Public tours of Hōkūle‘a. UH Hilo co-sponsored Educational Expo, Wailoa Pier, Hilo. A panel discussion on incorporating Hawaiian cultural knowledge with modern western science to meet the sustainability challenges facing Hawai‘i today was held at UH Hilo in February. The discussion was part of the 6th Annual Hawai‘i Sustainability in Higher Education Summit held over the course of three days on Hawai‘i Island. Delegations from all 10 UH campuses gathered to learn from local practitioners, national experts, and each other, and to set the action agenda for upcoming campus initiatives. On July 1st, the new College of Natural and Health Sciences will be established. It will house the current Division of Natural Sciences, School of Nursing, and Department of Kinesiology and Exercise Sciences. Jim Beets, professor of marine science and current chair of the Division of Natural Sciences, has agreed to serve as the interim dean of the new college. A national search for a permanent dean will soon be launched. 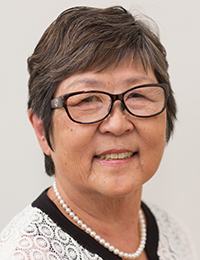 And we have a recent update from UH President David Lassner about the search for the next permanent UH Hilo chancellor, now expected to be completed by the end of 2018 with our new leader in place in spring 2019. These are just a few of the exciting things happening at UH Hilo as we work together to provide positive learning experiences and support to prepare students to thrive, compete, innovate and lead. I wish you all a safe and wonderful summer.